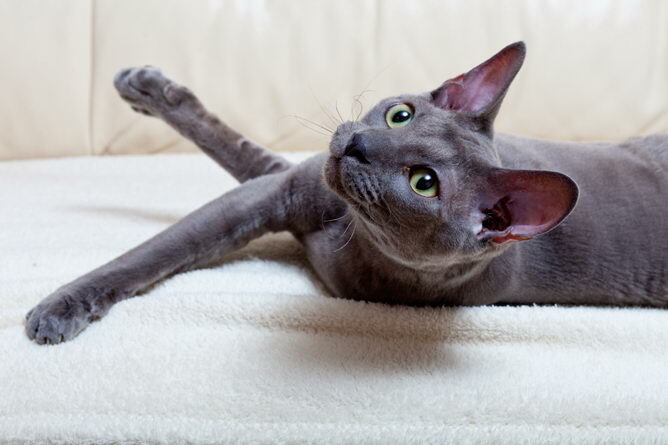 Cornish Rex cat breed information and advice. Nothing compares to the mischievous and loving Cornish Rex cat. Just like the mischievous mythical creatures, Cornish Rex are akin to pixies with their large ears, cheeky faces and naughty antics! Always on the go and ready to play at any time, 'Cornies' never seem to take their foot off the accelerator, but they still love plenty of cuddles with their chosen humans - but you only have to hint at playtime and off they go again! Kim Hill, chairman of the Cornish Rex Cat Society, has bred these comical critters for over 20 years. She says: "I love them so much, I call them 'dog cats' because mine will walk on a lead and will do anything for a treat! They never seem to grow up either!" Dog-like is a good way to describe the Cornish Rex; they love to play fetch with you and are devoted to their owners, following their favourite human from room to room. Once they've sussed you out and decided that you are worthy of their affection, they will attach themselves to you and it can be hard to move them from your lap! "Do make sure you give them plenty of interaction and attention otherwise they can be quite destructive if they get bored," advises Kim. "I always say to people to think about having a playmate for them - it doesn't have to be a Cornish as they get on well with dogs and other cats." Nicole Rankin of the Rex Cat Club agrees: "The activity levels of the Cornish are extremely high. They really are the masters of running and catching with their paws like 'little hands'. Those little paws can get up to some trouble when being inquisitive; opening doors and cupboards, pinching items of worth and then running with your prized possessions at top speeds to hide them away. They like nothing more than a good puzzle and are exceptionally smart." The Cornish Rex can be traced back to a farm in Cornwall in 1950, when a non-pedigree tortie and white gave birth to a curly-coated kitten among a litter of five. The owner had previously bred Rex rabbits, which also have curly coats, and recognized the distinctive look. The cat was later mated back to his mother, who produced more curly-coated kittens and so the new breed began. The breeding programme was dogged by infertility, a limited gene pool and some untimely deaths. Luckily, by 1959 a new group of British breeders had taken up the breed and the Cornish Rex was saved. The Cornish Rex cat should be a shorthaired cat of elegant foreign type, well balanced with particularly long slender legs and tail - they stand high, as if on tiptoe. The head is a medium wedge shape with gentle lines and high cheekbones. Their large, almost 'mussel shell-shaped' ears are very expressive and have an important effect on the overall appearance of the head, being set rather high. The coat is the distinguishing feature that differentiates Cornish Rex from other breeds, as it is short, dense and silky without guard hairs, and has neat, even and well-defined waves, especially over the back and sides. The cat is medium-sized and his delicate appearance belies a muscular build. Although renowned for having lively, sometimes mischievous characters, they are also very sociable and loving. This is the ideal choice if you are looking for an entertaining and interactive pet. Indeed, the talkative and playful Cornish Rex is the purrfect cat to come home to, craving attention and determined to be treated as a member of the family. You may have to be patient when looking for a Cornish Rex kitten, or be prepared to travel, as they are currently reasonably scarce. There are a number of clubs representing the Cornish Rex, and they should be able to provide you with a kitten list, which will give details of breeders who currently have kittens for sale. Make sure, as with all breeds, that you look for healthy, lively kittens with clean, clear eyes. Cornish Rex are a very low maintenance breed as they just require a hand groom to get rid of any loose hairs, although they do enjoy a weekly brush with a soft bristled brush. They moult twice a year, both in the summer and winter. It is said by some that Cornish Rex are a good breed to have if you suffer from allergies as their fur doesn't shed in the usual way, but it's always best to spend time with the cats to make sure. Nicole says: "The health of the Cornish Rex over the past 30 years in the UK has surpassed any other breed. Rigorous out-crossing has increased the gene pool and added stamina to the breed. In the UK lines alone there are no know hereditary diseases present. However, breeding with cats from the continent could potentially bring back heart diseases." The Cornish Rex cat will become lonely and bored (and therefore tempted to be destructive) if left alone for long, so it's always best to give them a feline companion. Woe betide the owner who doesn't give them enough cat furniture for climbing! Remember! All breed profiles are general and every cat is an individual.